A felony and misdemeanor are levels of crimes. If you are charged with a misdemeanor, this is a crime which has a maximum possible penalty of six months, up to a year. A felony is a crime with a steeper penalty that is jail or prison time greater than one year. 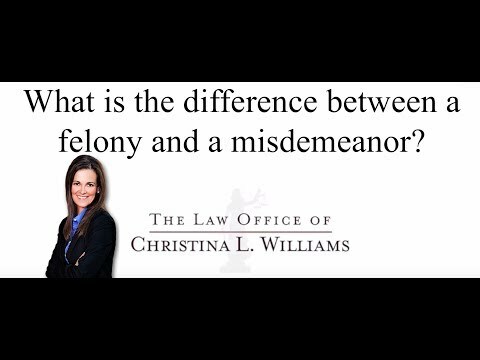 The bigger picture of being charged with a misdemeanor vs. a felony is that if you’re convicted of the felony, you lose certain constitutional rights. Those rights include the right to have a firearm, the right to vote, the right to hold public office, the right to serve on a jury. They also affect your credibility and your reputation in the community. You want to get a very experienced and knowledgeable criminal defense attorney on your side if you’re charged with a crime and, specifically if you’re charged with a felony. Certain misdemeanors also carry consequences that will follow you throughout your life. For example, a family violence battery, you would lose your right to own or possess a firearm for life if you are convicted of that misdemeanor. In a lot of cases, you also have to disclose a criminal history during job interviews. If you’re in school and applying for jobs, or if you wanted to change jobs, or move to a different community, you would potentially have to explain any sort of criminal conviction. It’s always important to protect your criminal record. You don't want to have to ever explain it later or have it get in the way of your future plans.